Размер корпуса (мм): 44.5 мм.,толщина 10.9 мм. Series: Master Eight Days Style (Gender): Mens Case Material: 18k rose Gold Dial Color: Silver Movement: Automatic Functions: Date, Small Seconds, Day/Night, 8-day power reserve Crystal Material: Sapphire Crystal Case Diameter: 41.5 mm Case Thickness: 10.9 mm Caseback: Transparent Bezel Material: 18kt Rose Gold Bezel Function: Fixed Water Resistance: 50m / 165ft (suitable for showering; not usually suitable for swimming; unsuitable for diving) Crown Material: 18k Rose Gold Calendar: Automatic Calendar Watch Bracelet / Strap Material: Leather - Brown Crocodile Watch Clasp Material: Rose Gold Deployant Buckle Additional Info: Coates Soleilles finish on movement visible through transparent sapphire caseback Description: The watch features: Hours, Minutes, Small seconds hand, Large double-window Date Diplay, AM/PM Indicator & Amazing 8 Day Power Reserve, with a Power Reserve Indicator. Transparent case back - movement finished with beautiful Coates Soleillees (sunburst finish). 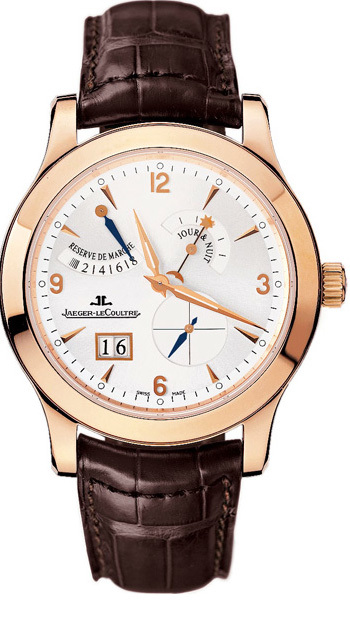 Есть вопросы по Jaeger LeCoultre Q1602420 Master Control 1000 Hours?